It has been a long time since our last status update! The reason is the end of the previous sprint caught quite some of the YaST Team members on vacations and, when the vacation period was over, we were so anxious to jump into development to make YaST another little bit better that the blog post somehow fell behind. But it’s time to pay our (reporting) debts. So these are some of the highlights of the 33th development sprint that finished on April 11th. During this sprint, a new module has been added to the YaST tool box: YaST2 Configuration Management. This module offers integration between AutoYaST and configuration management systems like Salt. The idea is that AutoYaST will take care of system installation (partitioning, network setup, etc.) and, if desired, the system configuration can be delegated to one of those external tools. 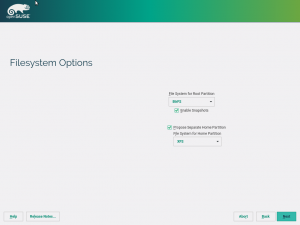 The YaST Configuration Management module was born during an internal SUSE workshop during the last summer and it got more love during HackWeek 14 and 15. Now it is officially part of the YaST family and it will be included in the upcoming releases. 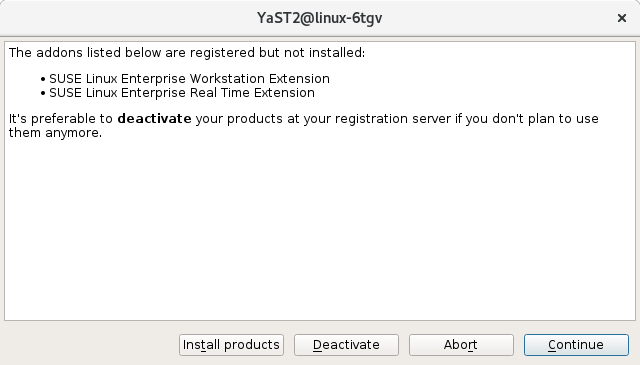 The YaST installer already allows extending the installation work flow by add-on extensions. 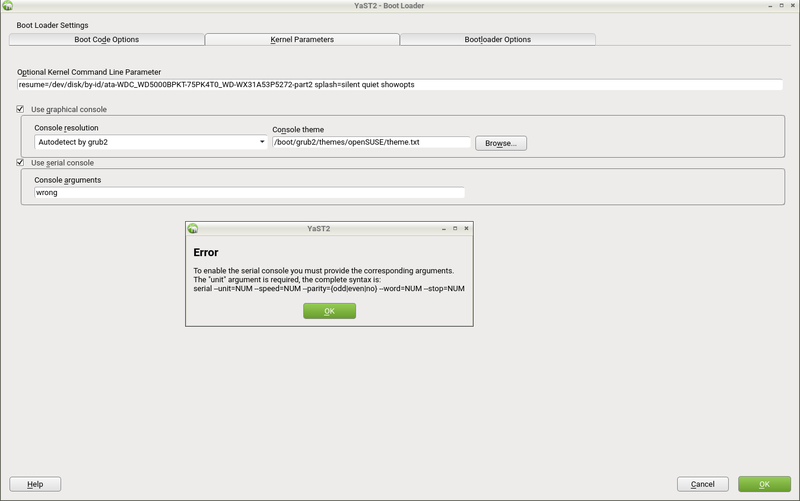 However, this was only supported for the SUSE tag repositories used on the ISO installation media. That means the online repositories, which normally use the RPM-MD data format, could not use this feature. This sprint we extended the support also for the other repository formats (basically any repository format supported by libzypp). The original limitation was caused by the fact that the other repository types do not support other files except the RPM packages. To overcome this limitation we now support packaging the installer extension files into a standard RPM package which can be then provided by any repository type. 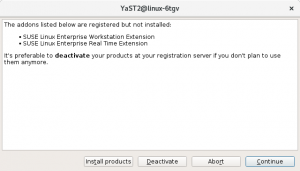 The implementation is documented and there is the YaST:extension OBS project with a simple example extension. CaaSP deserves its own YaST package! Among other things, our team is working hard to make YaST fulfill the requirements of the upcoming Containers as a Service Platform (CaaSP) product. As part of this effort, we have added some new features, discovered (and fixed) some bugs, improved documentation and so on. We’ve also added some specific CaaSP code, so during this sprint we’ve decided to create a new dedicated package (yast2-caasp) and move the code there. Currently it only contains system role handlers and some additional documentation, but most probably we will add some stuff during the upcoming months. Also the bootloader module has been improved to better handle invalid partitioning proposal in the CaaSP product. When the partitioning proposal did not contain a valid root directory then the bootloader module crashed. After the fix it now displays details about the problem so the user can manually fix the configuration. An important part of keeping the quality in a job is investing in the quality of the tools. So during this sprint we decided to improve the capabilities of the AutoYaST integration tests. To help with debugging, AYTests will now store a screenshot and, if possible, YaST2 logs from installation/upgrade under the workspace. The screenshot will be refreshed every 30 seconds so, if a timeout occurs, it will be now easy to find out where the process got stuck. Recently, a new set of packages were introduced into Tumbleweed to help setting up the local installation servers. 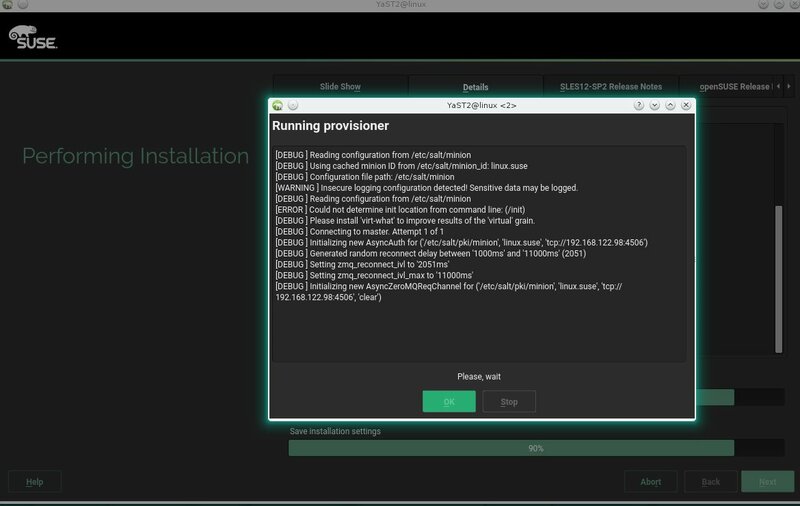 They are named tftpboot-installation-<PRODUCT>-<ARCH> (for example tftpboot-installation-openSUSE-Tumbleweed-x86_64) and are intended to make it easy to set up the PXE boot environment for an installation server. These packages basically contain the installation environment as found on the SUSE installation media. And this enables mksusecd to create a network installation image from it. For example, the package above installs its files into directory /srv/tftpboot/openSUSE-Tumbleweed-x86_64. 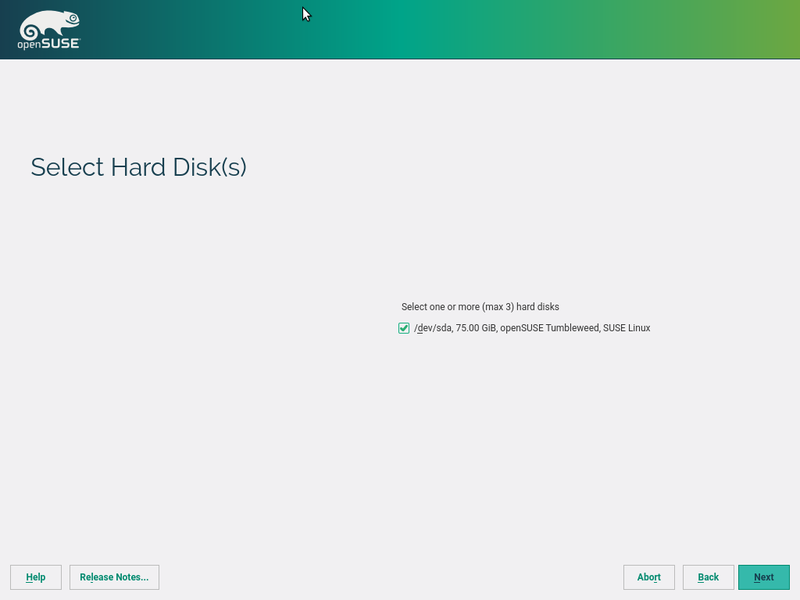 and we get a network installation ISO image that will install the Tumbleweed distribution using the official openSUSE Tumbleweed repository. that will create a FAT partition for the data, which is a bit more convenient when you plan to put the image on an USB stick (and yes, you can still use the image to burn a DVD). The YaST bootloader module can be used to configure the parameters to allow accessing the system’s boot process through a serial console. But that’s a relatively complex topic and is easy to make mistakes when specifying such parameters. In the past, the message displayed by YaST in case of error was not helpful enough. To improve usability, the new pop-up is nicer and includes a proper example, as can be seen in the following screenshot. The previous sprint we brought in the ability to use encryption for both partition-based and LVM-based proposals. This time we go a step further and present a new guided setup that allows you to do even more. We have worked hand in hand with our UX experts to design a new proposal wizard composed by four steps. 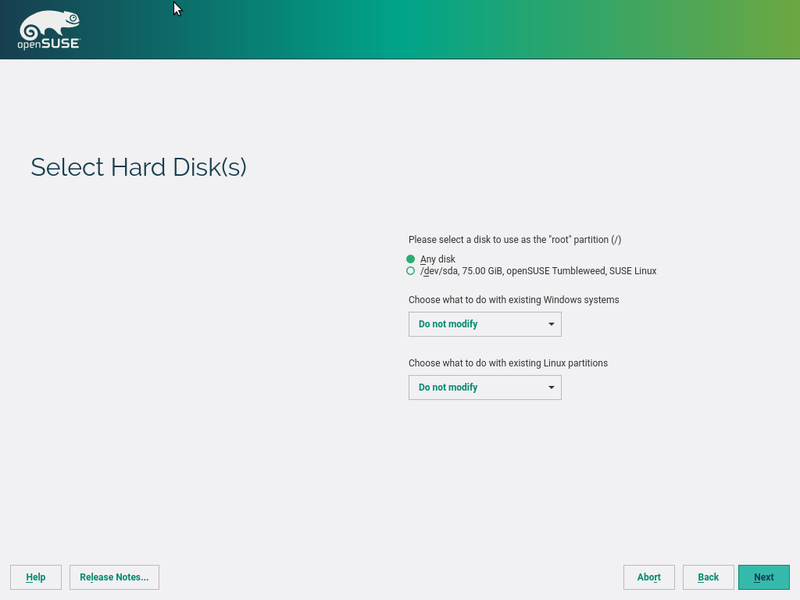 In the first one, a list with the available disks is showed and you can select which ones to use for your fresh installation. 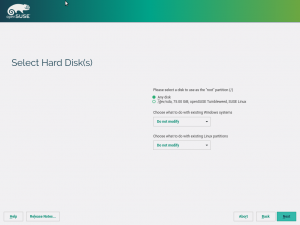 In the second screen, you can select a specific disk to be used for the root partition, and also, you might decide what to do with the existing Windows and Linux installed systems. Currently, this last functionality is only illustrative, but it will become functional in the upcoming sprints. The third step is surely more familiar for you. As in the previous sprint, here you can select the LVM usage and encryption. And of course, the encryption password will be checked to ensure you use it is strong enough. Finally, in the last step the filesystem type for the root partition can be selected. Moreover, you can decide whether to use a separate home or not. Or you can select another filesystem type for your home. 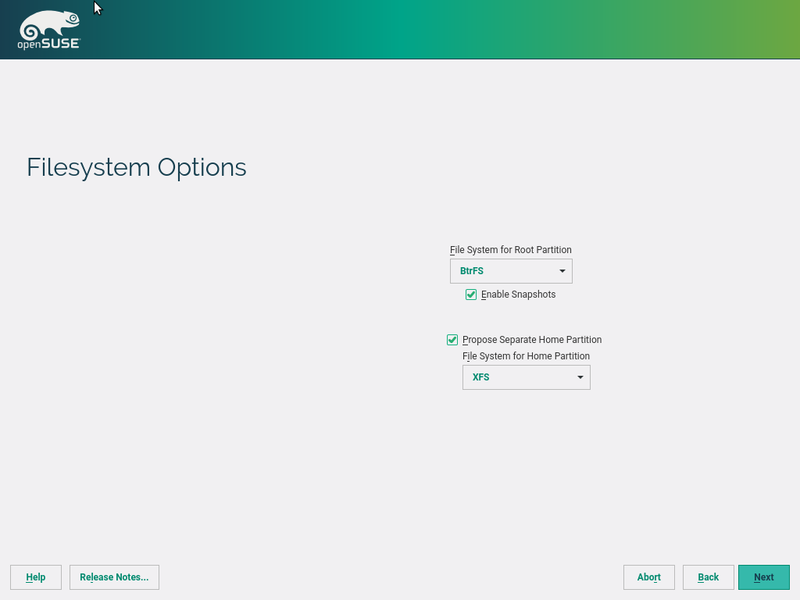 As result of the wizard, a new partition schema is automatically created taking into account all the options you have selected. And naturally, that is only the first version. We will let know about the news in the guided setup in following sprints. Before the live Service Pack migration the system can be manually modified in many ways producing inconsistencies between the installed system and the extensions/modules registered in the registration server. In this sprint we have added some steps that will allow the user to fix the inconsistencies. Also the displayed summary of the available migrations has been improved showing information about products without any migration available (e.g. third party addons). For the online migration it is important to be able to rollback to the original state (before the migration started) when a problem occurs or the migration is aborted by user. Now the user will be able to decide if the registered but not installed products should be deactivated as part of the rollback. As usual, this report only covers a relatively small part of all the work done during the previous sprint and, as usual, you will have to wait until the end of the current sprint to get more exciting news. The bright side is that the sprint will finish in a matter of days, so you will only need to wait one week to read our next report. Stay tuned and have a lot of fun!